Photo courtesy of the author. All rights reserved. The growing season in Kherson lasts from spring to autumn. If you drive through the region in those months, you see people sowing, weeding and harvesting vegetables, melons and squashes. But most of this activity is not regulated by law, and even the farms themselves are often part of the shadow economy. “Listen, I’ve worked in the fields often enough,” an 18 year-old tells his friend in July 2018. They are selling watermelons off a van beside the market in Chaplynka, a village on the border between the Kherson region and annexed Crimea. “You pick them and pass them from hand to hand, in a chain – it’s not a hard job,” he says. According to him, harvesting melons and watermelons is the best job around, according to the young man. You can earn 600-700 hryvnya (£16-£19) a day if you fulfill the quota. Everyone in the village knows where to go if they’re looking for work in the fields. Buses pick workers up in the early morning at the stop by the local supermarket, and drop them off again in the evening. Some people then go straight to the supermarket and come out with bags full of groceries bought out of their day’s pay. Others disappear into the local bar to spend their earnings on drink. People who have been working in the fields are immediately recognisable by their sunburnt faces and mud-streaked clothing and shoes. A man is re-arranging the benches in the red minibus parked outside the supermarket after the workers have left. The bus has rows of benches instead of seats – you can fit more people in that way. It’s designed to hold ten people, but sometimes 30-40 get squeezed in, and if the police stop it the driver gets a fine. Driving the field workers back and forth is a family business. The husband drives the bus; the wife has the list of workers. This system is called a “brigade”, and she’s the brigadier. The bus appeared only recently: before that they hired a driver with his own car. “We’ve been a brigade for four years now – it’s solid,” says the husband. The brigadier’s work consists of rustling up the produce orders, getting the people together, driving them, checking that the work is done properly and then making sure the workers are paid. Good brigades are in great demand, and can dictate conditions to the farmers. “They can’t refuse to pay, of course they can’t. We’ve been in the business long enough and we know our customers,” says the husband. The brigade makes no particular demands on the workers themselves: they just have to do their work well. They earn between 280 and 350 hryvnya a day. The husband tells me he gives each one a contract. Family businesses, where the wife is the brigadier and the husband the driver, are common in the region. Natalya, from the village of Novotyahynka, works in a similar set up. From April till September, she’s out working in the fields every day except Sundays. She’s been doing this for 10 years now, and admits it’s hard work – you need to be in good health. I’m talking to Natalya at the supermarket where the field workers come back in their minibus. Today, she came back with nothing – she didn’t manage to earn a thing. Situations like this are, however, rare. “Good farmers usually pay on time, and pay well,” Natalya tells me. There’s a cliché in the region that only “people with money problems” or “large families” work in the fields. But there are lots of public service workers and school students weeding seed beds and harvesting watermelons. It’s a good opportunity to earn a bit of extra cash, although nobody advertises it. The agricultural sector is one of the Kherson region’s three main sources of work. But recently a problem has arisen: there aren’t enough people to work in it. The job centre puts two reasons forward for this: demography and migration. “People are abandoning their fruit farms – they earn too little from them. A lot of people I know are moving to Poland,” says Anya. She is 28 and lives with her husband in the village of Zburyevka, and has been a small farmer for 10 years now. They have half a hectare on which they grow potatoes, aubergines and peppers. It’s too small a plot for watermelons. “Sometimes we hire people to help, or we go and work on other people’s plots. Workers aren’t keen – we only need a couple of hours’ work, so we often get family members to help instead. That’s how everybody lives here,” says Anya, adding that their earnings have dropped since the annexation of Crimea and the war in Donbas. The family haven’t yet found an alternative outlet for their produce – they grow too little to make it worthwhile to transport it outside the region. So they have gone on taking it to the wholesale market in Velyki Kopani, where there are now many fewer customers. They now earn $3,000 in a season, and can live on this for the year, as well as buying seeds and so on for the next. But for several years they haven’t been able to buy the tractor they need to make their work easier. Until recently, Androy, from the small town of Kalanchak, also in the Kherson region, grew melons and squash in his field and sold them along the road to Crimea, as did many other locals. But the road is now empty of traffic. He has rented his field out for growing grain and is working as a taxi driver. He isn’t planning to emigrate: “No one needs us over there”. Ninety percent of melon, fruit and vegetable market trading in the Kherson region is illegal. Local farmers, however, are aiming to change this situation: they are hoping to reach EU markets with their produce. And this is a subject of discussion at an annual watermelon festival held in Hola Prystan. Since 1969, this small city has housed the Institute of Southern Vegetable and Melon Production, whose aim is to develop agriculture and increase productivity in the region. “Over the last five years, we have been concentrating on the creation of heat- and drought-resistant cultivars” “says Dr Oleksandr Shablya, the Institute’s deputy scientific director. 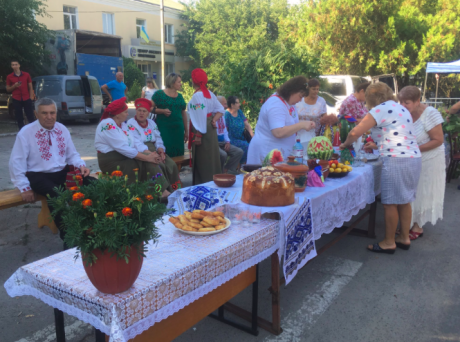 Meanwhile, the festival is really taking off – farmers are exhibiting their produce, people are coming up to try out the fruit, there are performances from folk groups and there is a long queue next to a truck with watermelons from Dolmatovka. 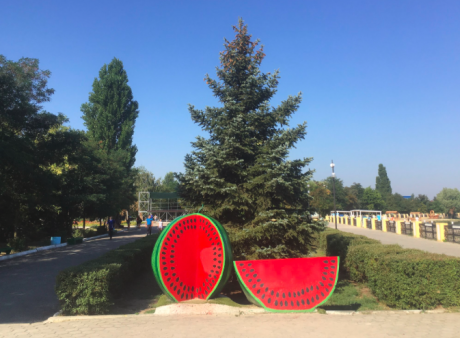 In a summerhouse with a view of the Dnieper and its riverfront a competition to find the largest watermelon grown by farmers this year is being announced. In the shade of the Institute’s stand, Shablya is explaining that despite the popularity of Kherson watermelons in Ukraine, they are still uncompetitive in Europe. Away from the hubbub of the festival, larger farmers, agro-holdings, officials and specialists from the Institute are holding a discussion on the future of the sector. For the local product to be competitive in the EU, farmers also need to get their heads round the issues of cheaper logistics, packaging, crossing borders and labour mechanisation. In summer 2017, farmers got together with Nibulon agri-holding to run a promo campaign. 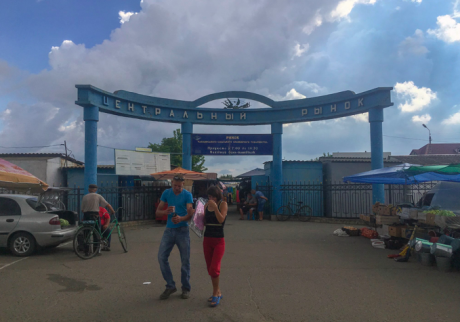 They sent a barge-full of watermelons from the Kherson region to Kyiv, and as it was the first barge for 14 years, the media went to town on the story. “That was a test drive, to draw public attention to the fact that the Dnieper is alive and well,” Oleksandr Sinenko of the Southern Union Cooperative and one of the people behind the stunt tells me. “Why did you send just one barge last year?” asks Andriy Shablya of the Fruit and Vegetable Institute. “Several farming companies with a legal status, who pay taxes, united to have it happen. The watermelons they sent were bought by a chain of supermarkets who only work with officially registered companies. And the barge provided by Nibulon has the same status.” The initiative was also supported by USAID, and another watermelon delivery, this time by a number of barges – took place in 2018. While the sector’s issues were still being debated, the Festival committee announced its prize winners. 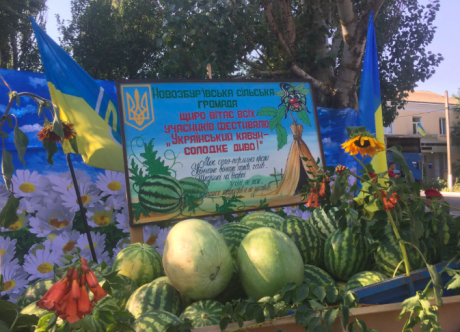 First prize went to Volodymyr Finochko, a farmer from Novaya Zburyevka who had grown a watermelon weighing 25kg. Work in the fields comes to a halt in the winter months. Agricultural workers spend their time at home, awaiting the spring, although some manage to get jobs in greengrocers’ shops and others look for work through the job centres. But few people search for permanent work: this mainly exists in the state sector, where the application procedure is complex and wages are lower. “Your back may be sore, but your head won’t be,” joke those who prefer outdoor work. Once spring comes, everything will probably much the same for them. If anything does change in the Kherson area, it will most likely be in the direction of Poland. “Escape to Poland!” shout the advertising hoardings that have been springing up like mushrooms over the last few years. And since June, there have been direct flights between Kherson and Lublin.